La Cigale Exclusive Country Estate in Chelsea Downs Conservancy, Theescombe, Port Elizabeth goes on auction on Thursday 28th February at 11 am and is one property not to be missed. The property is situated in a sea-facing nature conservancy and is only 3.5km away from unspoilt beaches. It is also only 10 minutes from Port Elizabeth International Airport, a mere 5 minutes from the city and 10 minutes from the N2 Highway. Its prime location plays a great role in the success of the property. 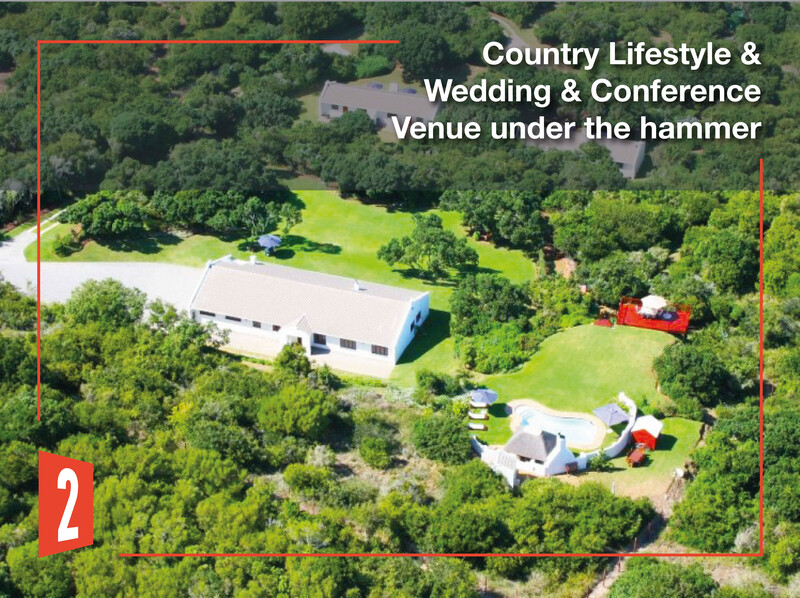 La Cigale is an all-in-one venue that specialises in weddings, conferences, corporate and private functions as well as offering self-catering accommodation. The property has recently been renovated and is comprised of the main house, 4 self-catering chalets, a multi-functional venue, a conference centre and a lovely chapel. The conference centre and function venue, wedding venue and the chapel are fully air-conditioned and the chalets are well-furbished and well-maintained. The property also has a borehole with 1300 litres per hour capacity and 40 000 litres linked to the irrigation system which helps to maintain the stunning gardens on the property. The exteriors of the buildings have been painted and all the wooden decks and walkways have been revarnished. The property has a swimming pool with a deck area that is well-kept. La Cigale also boasts a sporting field type lawn that is perfect for games and activities, as well as an observation deck with the most breath-taking view around! Safety is also no issue as the entire property is surrounded by an electric fence and can only be accessed through a remote-controlled gate. Each unit also has its own alarm. This property can be sold with or without the movable assets or can be purchased separately. With venue weddings and conferences becoming more popular, properties such as this one are a great investment, and close proximity to the airport and city is a bonus. La Cigale, with all that it has to offer, must be seen to be appreciated. For more information on the property or to arrange a viewing, contact Brad Dowlman from In2assets Properties on 073 757 9533 or bdowlman@in2assets.com or visit www.in2assets.com.